HomeElder I. Batman: Batman Baptizes! Elder I. Batman: Batman Baptizes! Jose was baptized and it was awesome. 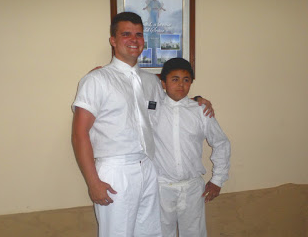 I did the baptism and it was a great experience. Getting a baptism is like a spiritual high. Its great. Jose is excited to progress more in the Gospel. He loves to read the Book of Mormon and come to church. His Mom is interested in learning more after seeing the change in her. He can become a Deacon in December 24. I am excited for him. I believe he will be a missionary some day.